A new enhanced doclet (written by Gerald Boersma) is now available. It has much more option than the legacy previous one. You will find detailed instructions here. An open source doclet is now available on github.. It's also available in Maven central for easy inclusion in any java projects. Declare the nl.talsmasoftware.umldoclet.UMLDoclet class to be used by javadoc (will by default also delegate to Standard doclet, so all-in-one). All customizable options will become documented on the github page before the 1.0.0 release. 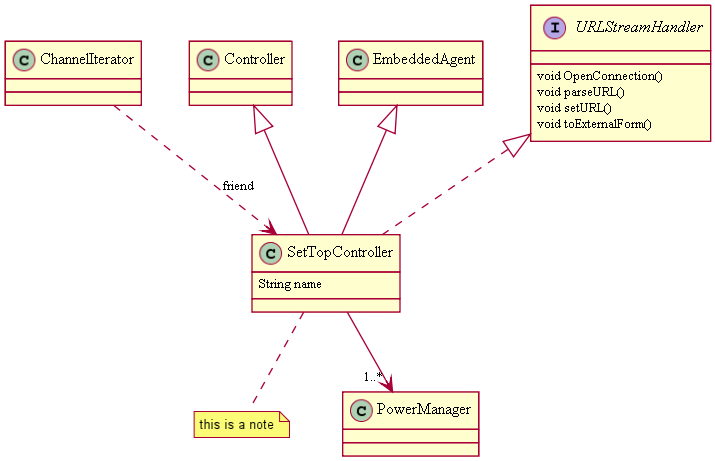 You can generate a PlantUML description for UML-class diagram out of Java-source. Only public fields and methods will be exported. The association are based only on field declaration and Javadoc-Tags in methods. @overrideAssoc: can be used to mark a field-declaration not to export its association. "-J-DdestinationFile=uml.txt -J-DcreatePackages=false -J-DshowPublicMethods=true -J-DshowPublicConstructors=false -J-DshowPublicFields=true"